Welcome to the best burgers in London. 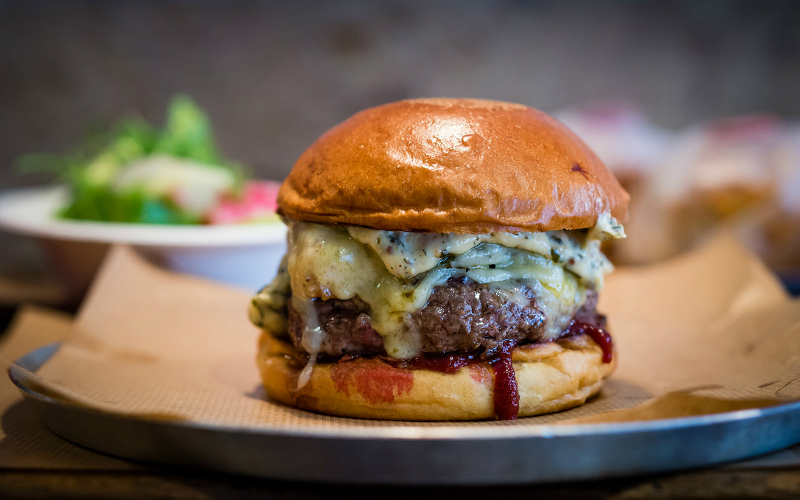 We love burgers and these are the best ones you can find in London town. WARNING it gets dirty! If you’re looking for a meat-free alternative check our our guide to the best bleeding vegan burgers in London. 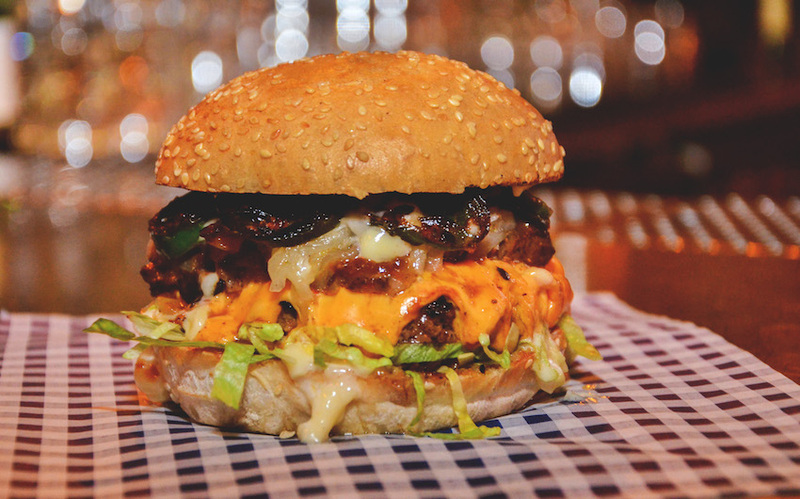 For burgers and boozy shakes into the small hours, MEATliquor will welcome you with open arms. And if you think you can handle your spice? Order the green chilli cheeseburger, chilli dog and chilli fries and if you can get that all down you in under ten minutes it’s on the house. But it’s defo not for the faint hearted. Honest Burgers are popping up all over the shop and serve up meaty-goodness all day long with a breakfast and brunch menu. Opt for their cheeseburger with dry aged beef, red onion relish, lettuce and Mature Cheddar. All their burgers come with rosemary salted chips too. Just add in a side of onion rings and bacon ketchup and you’re good to go. 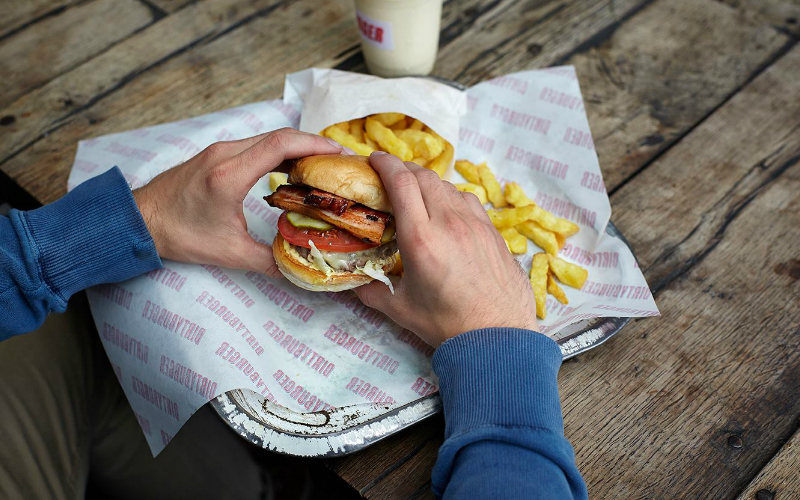 Flipping out some of the sloppiest burgers in London town, Patty & Bun are famed for their juicy patties, neon signs and bangin’ tunes. You can’t beat their ‘Ari Gold’ with an aged beef patty, cheese, pickled onions, smokey P&B mayo, ketchup, lettuce and tomato. Add in some rosemary salted chips, coleslaw & a couple of beers and you’ve got yourself a damn good dinner. Bleecker Burger is all about keeping it simple, serving up US-style burgers and fries with shakes, sodas and beers. No fancy starters, sides or specials, just rare breed, dry-aged beef cooked medium rare with homemade burger sauce, American cheese and a sesame seed bun. And when it tastes this good, you don’t need anything else. 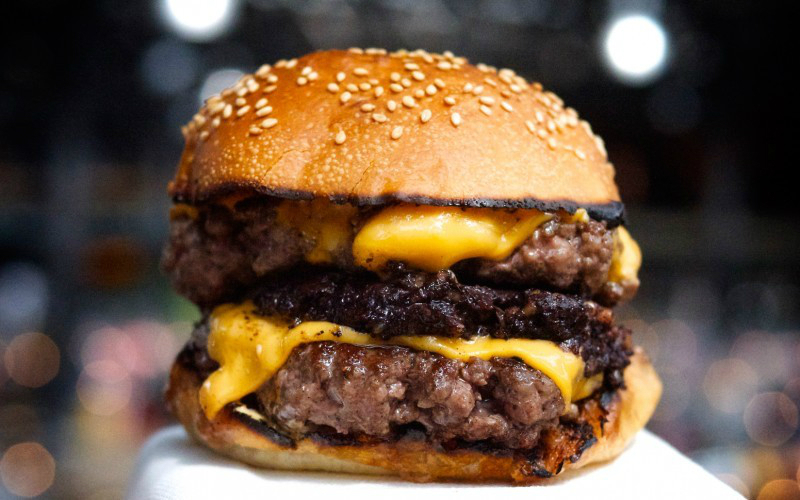 Order a double cheeseburger – it’s easily one of the best burgers in London. Dirty Bones is known for its good ol’ American comfort food, but the burgers are where it’s at. 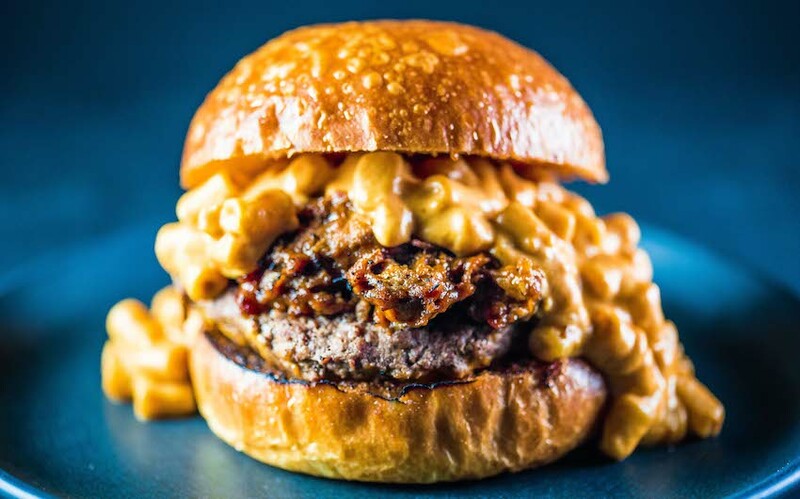 Especially the Mac Daddy; an aged beef burger topped with pulled beef short rib, oozy mac & cheese AND Dirty Bones BBQ sauce. There’s no polite way to eat one, so just get down and dirty with it. Mac & Wild is the home to The Wild Game Co and brings a taste of Scotland to Fitzrovia, with a menu of steaks, burgers and Scottish superfoods. 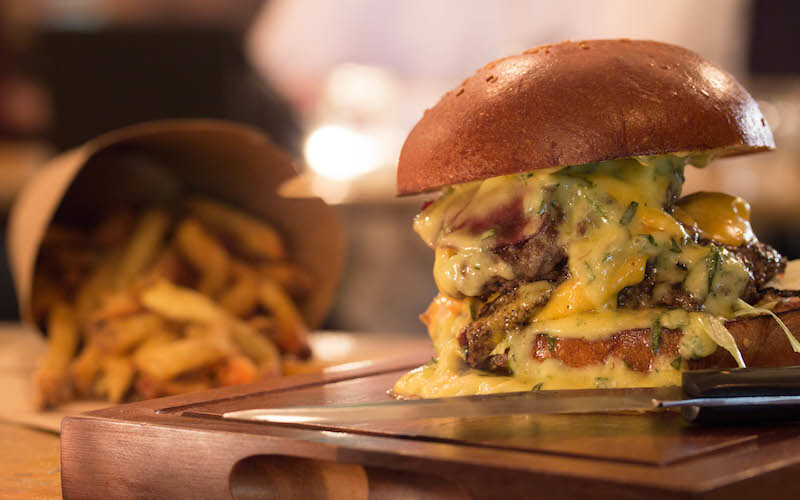 But what we’ve gone WILD about is their Veni-Moo burger, which was voted UK & London’s best burger 2016 and is made up of a beef patty, venison patty, cheese, bearnaise & caramelised onions. Of course, their hand-cut chips are bang on too, but if you’re after something a bit different give their Haggis Mac ‘N’ Cheese a go..you won’t be disappointed. 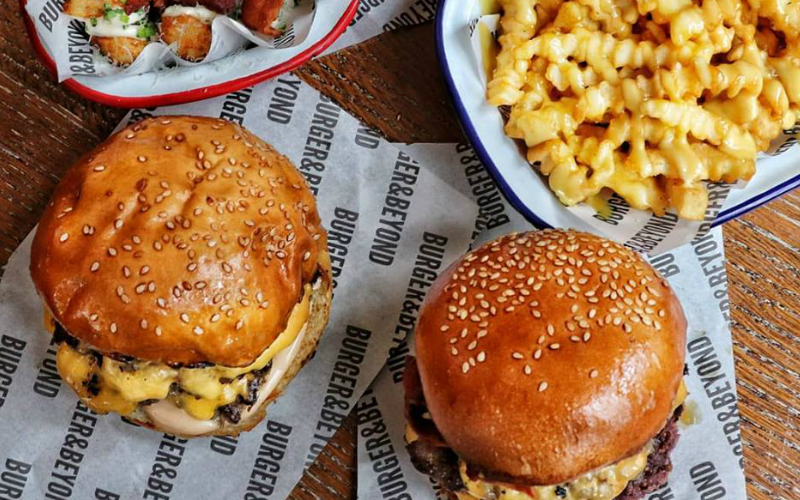 You may have already seen the burgers from Burger & Beyond on your news feed, you know, the super instagrammable ones that get your mouth watering…Well the burger vendors have just opened their first restaurant in Shoreditch. It’s serving up their filthy burgers along with some badass sides too, including the Dirty Tater Tots smothered in hot sauce and crispy bacon pieces. Make sure you leave room for dessert as they have a deep fried blueberry pie on the menu that you won’t wanna miss either. With just three kinds of burgers and two kinds of fries Dirty Burger’s menu is short and sweet, which means you can spend less time deciding and more time eating. If you’re gonna go dirty, go all the way dirty…that means a dirty bacon burger, plus both crinke cut AND onion fries, finished off with a thick Oreo shake. YUM. 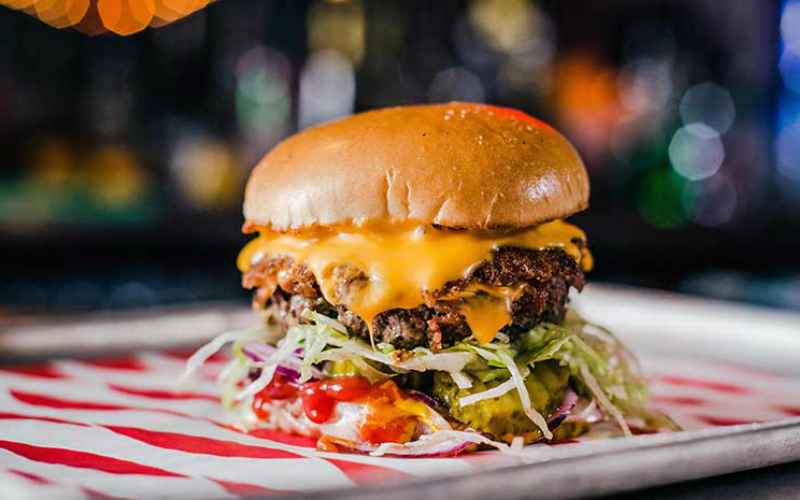 For burgers and boozy shakes into the small hours, MEATliquor will welcome you with open arms. And if you think you can handle your spice? Order the green chilli cheeseburger, chilli dog and chilli fries and if you can get that all down you in under ten minutes it’s on the house. But it’s defo not for the faint-hearted. Epic burger all round. Honest Burgers are popping up all over the shop and serve up meaty-goodness all day long with a breakfast and brunch menu. 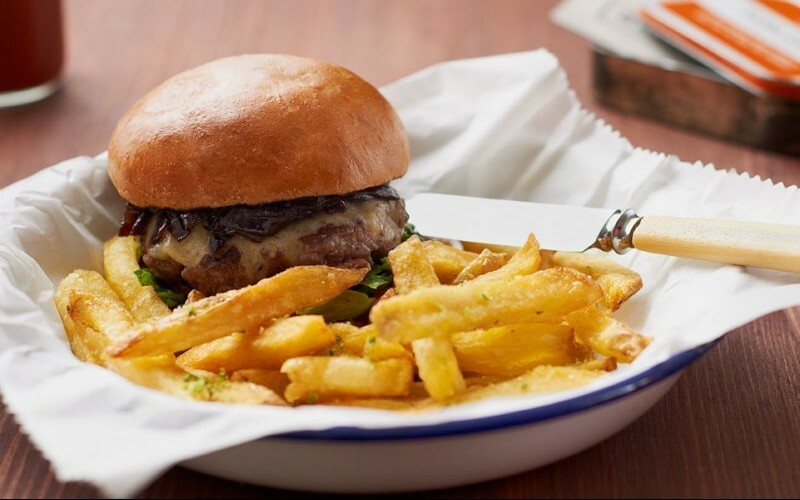 But when it comes to their burgers, opt for their cheeseburger with dry aged beef, red onion relish, lettuce and either Red Leicester, Mature Cheddar or Stilton. All their burgers come with rosemary salted chips too, so just add in a side of onion rings and bacon ketchup and you’re good to go. Lucky Chip knock out some mighty fine burgers. The Royale Wit Cheese – essentially a gourmet Big Mac – is always a fave but if you’re feeling rebellious, the El Chappo, with smoked bacon, roasted jalapenos, blue cheese and ailoli, will hit the spot. And with a changing monthly special named after a celeb, you’ve got even more of a reason to go back. Flipping out some of the sloppiest burgers in London town, Patty & Bun are famed for their juicy patties, neon signs and bangin’ tunes. You can’t beat their ‘Ari Gold’ with an aged beef patty, cheese, pickled onions, smokey P&B mayo, ketchup, lettuce and tomato, all in a brioche bun. Add in some rosemary salted chips, coleslaw & a couple of beers and you’ve got yourself a damn good dinner. Bleecker St. is all about keeping it simple, serving up US-style burgers and fries with shakes, sodas and beers. No fancy starters, sides or specials, just rare breed, dry-aged beef cooked medium rare with homemade burger sauce, American cheese and a sesame seed bun. And when it tastes this good, you don’t need anything else. Order a double cheeseburger and prepare to go to burger heaven.